It’s a 1985 fantasy/sci-fi classic that grossed nearly $400 million worldwide! Now, throw on your Nikes, pop in a VHS and rev up your time traveling car because October 21 is Back to the Future Day. First celebrated in 2015 ( that’s the year that Marty McFly and Doc Brown time-travel to in Back to the Future Part II), Back to the Future Day is a fun way to celebrate your past and get excited for your future. 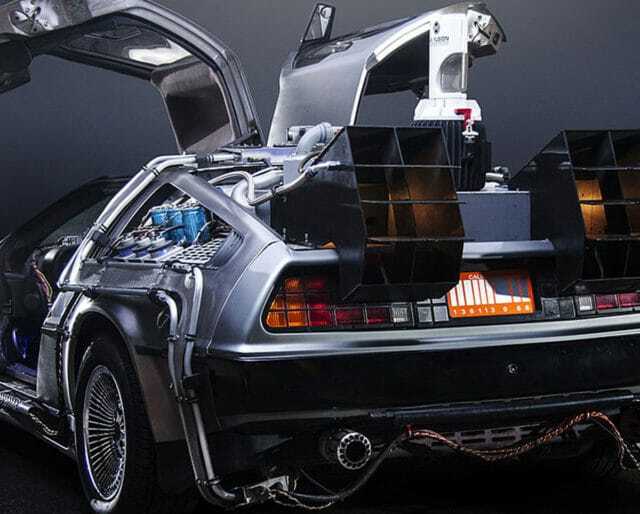 ​The creators of the movie, Robert Zemeckis and Bob Gale, decided to use a DeLorean as the car that enables Marty McFly and Doc to time travel; after the film’s release, Zemeckis and Gale received a thank-you letter from John DeLorean for using his car in the movie. ​After selling only 9,000 DeLoreans, production ceased and authorities charged John DeLorean with selling cocaine as a means to save his company. ​The first car, built in Ireland, was produced on January 21. ​American Express advertised a DeLorean plated in 24-karat gold. The price tag? $85,000. Only two sold. ​John DeLorean, who worked for Chevrolet, Chrysler, Packard, and Pontiac, established his own company with a vision of the DeLorean DMC-12. Just like you did back when you were a kid — and if you have kids they’ll love doing this, too — fill a box with items you’d want your future self to enjoy opening. For instance, things like pictures, tickets from a concert, or items from your wedding. And since this is something you’ll open in the future, be sure to also fill your box with things like a letter to your future self, a list of goals you hope to accomplish, or make resolutions you hope to change overtime. Once your box is full, put in your basement, in the back of a closet or — if you know you’ll be living in the same house for awhile — bury it in the backyard. Whip out boxes of old photos and reminisce about the past. If you have kids, this is a fun activity to do with them — if not, invite friends and family over (have them bring pictures, too) and talk about the good ol’ days. Okay, you may not have a DeLorean that’ll take you back in time to fix your past, but you can try to improve your present and your future by righting some wrongs. For example, reach out to an old friend you’ve lost touch with, try to mend a relationship, or pay back debts you may owe to someone. ​​5 Reason To Rewatch "Back To The Future." ​Although most of the futuristic details in the movie have not come true, it did include communication similar to FaceTime, voice recognition, and thumb print technology. Major movie studios passed on the original screenplay. ​President Reagan used a quote from the movie. ​President Reagan liked the fact that he was mentioned in the movie several times. He used the quote “Where we’re going, we don’t need cars” in his 1986 State of the Union speech. ​Princess Diana made an appearance at the movie’s premier in 1985. Because Back to the Future Day celebrates a movie that’s related to the past and the future, it makes you reflect on just about everything. Take time to ponder things you’ve accomplished over the past few years, as well as things you regret and may want to improve upon. As the name suggests, Back to the Future Day is about the future, so it’s the perfect time to set goals. Use this day to write down hopes and dreams that your future self will be proud of. Whether you’ve seen it a million times or not, there’s no better day to watch the movie than Back to the Future Day. So on October 21, start streaming!